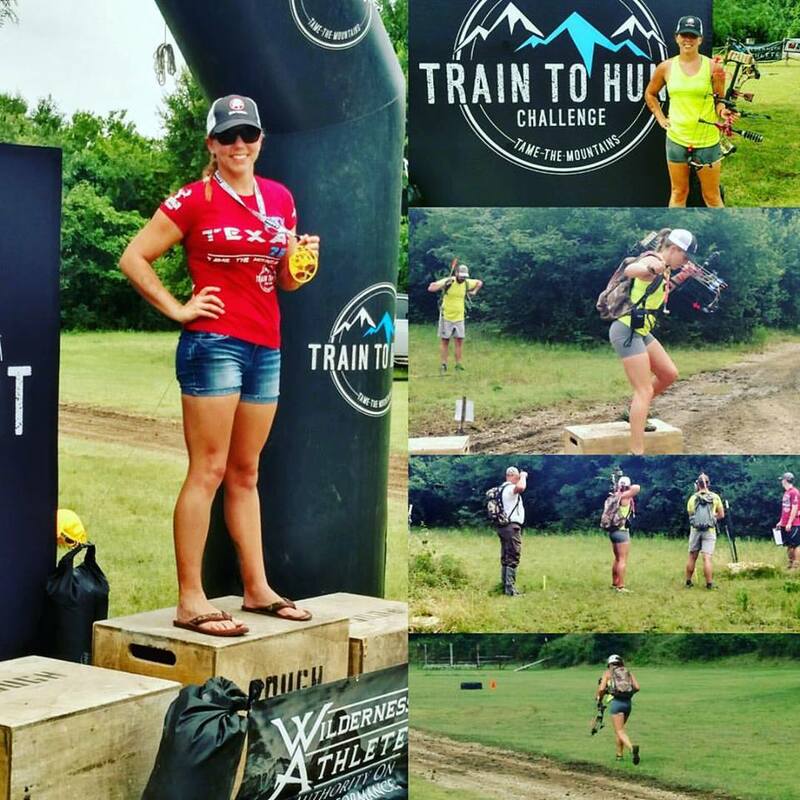 This weekend, I tried a little different type of multisport and checked out the first ever Train to Hunt Texas Challenge. 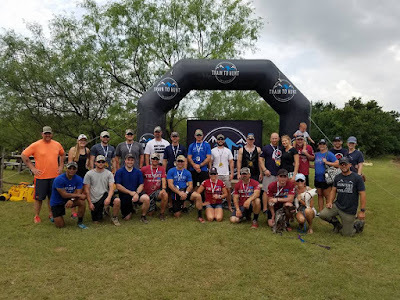 This event, which took place at Cinnamon Creek Ranch near Fort Worth, was the first of its kind in Texas and part of a larger, 16 event series that allows bowhunters to compete and qualify to race against each other at nationals in Utah this fall. I joined a women's bowhunting group and someone posted about the Train to Hunt challenge on the page and asked if anyone was competing. I took a look, saw it was a mix of fitness challenges and 3D archery, and decided, hey, that looks fun! So, I signed up. 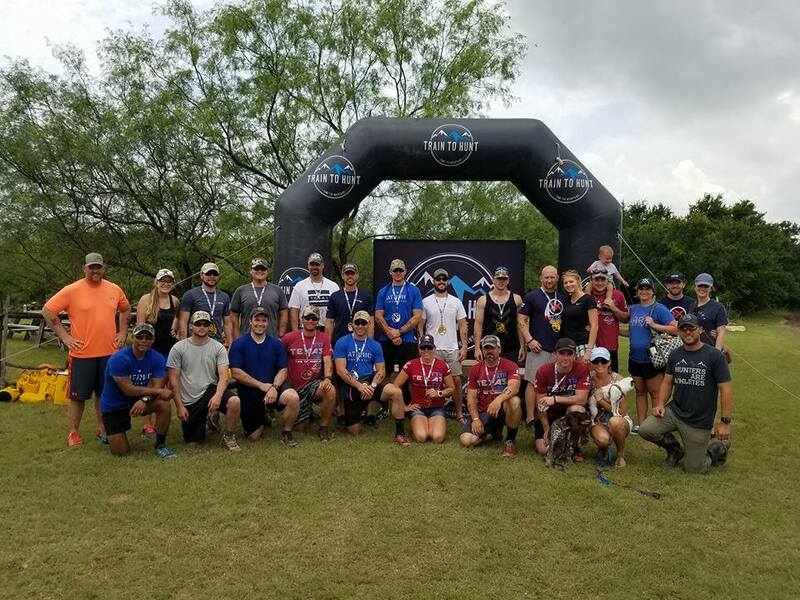 The events are two-day challenges that involve a 3D archery shoot, a "meat pack" run (a trail run that involves carrying a weighted pack to simulate packing out an animal once shot in a back country hunting situation), and a challenge course. The challenge course starts with a tire drag (simulating dragging a deer, something I've had to do a few times! 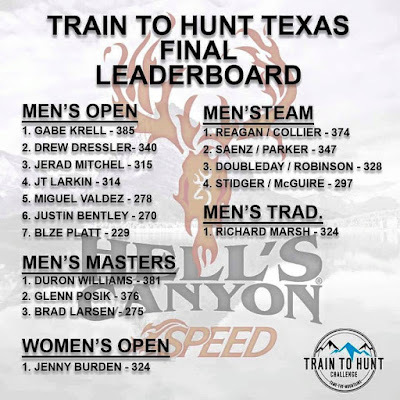 ), then has competitors run to the next station carrying their bow, where they progress through the course in a pattern of shoot-fitness challenge-run until they shoot six targets and complete the course by crossing the finish line. I figured since I'm training for an Ironman right now, I'd be pretty well set for this, so I wasn't too concerned with the fitness aspect. I did my best to brush up on my shooting, but that was definitely the part I was most nervous about since my shots beyond 25 yards were far from consistent, and the website said the longest might be up to 60 yards. 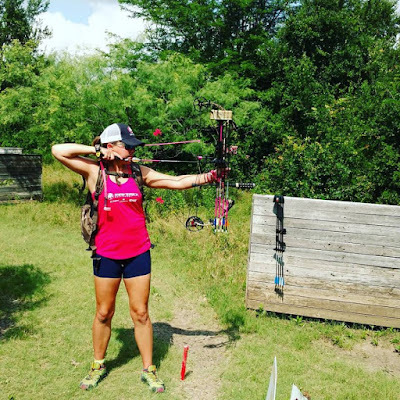 (Those who do not bowhunt or shoot archery: 60 yards is kind of a lot!) Regardless, I was paid up, entered, and we headed to Fort Worth to see what this was all about. I was kind of disappointed to not have any direct competition, but knew I'd give what I had anyhow. 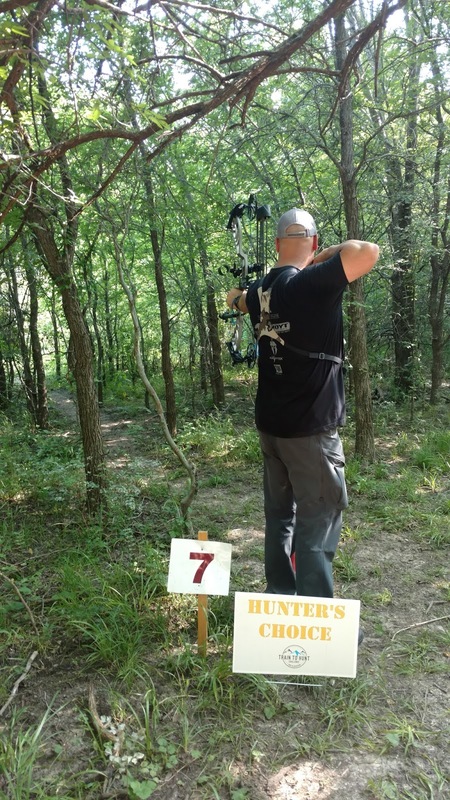 I got my competitor number 8 written on my arms and went back to my car to get my bow and head to the outdoor range to warm up a little and see where things stood. My sight was OFF at 30 yards, which was discouraging because I left my wrench to adjust it at home, so I shot a few more rounds to get a good idea of how to guesstimate things and called it that. The other competitors on the range were nice, but a bit stand-offish at first. I was naturally defenseive and figured it was because I was a woman, but as we got closer to starting, I really think it was just a matter of many of us being new to this type of event (or, if they weren't new, they didn't recognize those of us that were.) 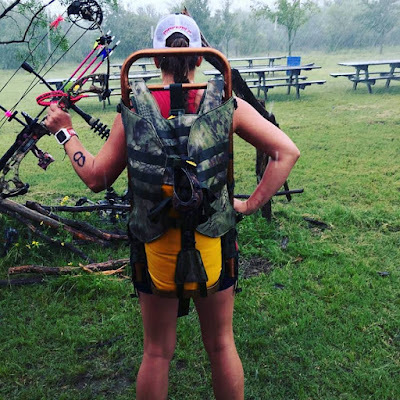 I've most definitely encountered plenty of men in the world of hunting who are downright offended at my presence in their playground, but will say with certainty that was not the case at this event. As we sat at the pre-shoot meeting everyone loosened up and began talking to each other, including me, and once we broke down in to our groups for the 3D shoot, things were relaxed and I started to think this was going to be fun. I did OK- not awesome, since I missed at least 4 targets completely because of their distance and my lack of an ability to properly sight that. I NEVER completely miss at home, so I was frustrated, but learning, and overall really enjoying it. I scored a 40 out of 100, which is pretty bad. But, hey, I can only go up from there! My goal next year is to shoot a 60 or better. There were 20 targets with a maximum of 5 points each. I think I can do that! The Cinnamon Creek staff was great all around. Like I said, I've encountered my fair share of men who get downright offended that women are hunting or otherwise invading what they perceive as their space. I've had archery shop employees blatantly ignore me, talk to me like I'm a child, or both. That was never once an attitude I got from this shop, and that was really nice. I was at the event totally by myself, so it was encouraging to be treated like everyone else competing and shown appreciation for my business and an interest in my success with shooting. I definitely recommend them to anyone in the area, or even if you're just passing through. We got that direction when we go to the NASCAR races, so I'll definitely be back. 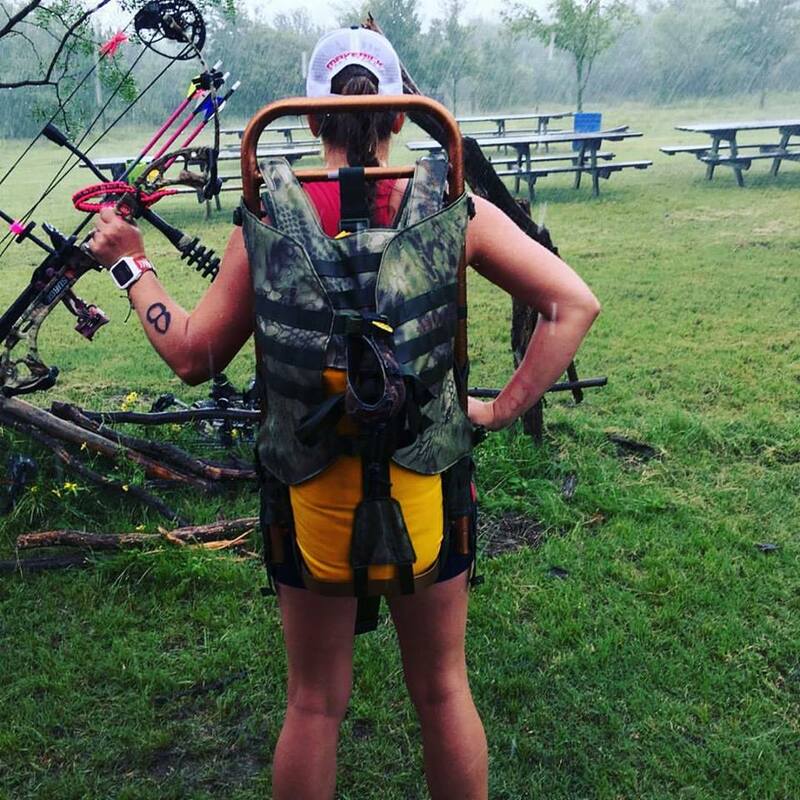 This event required that each racer carry their bow, three arrows, their release, and a designated amount of weight. I had 60 pounds, while other men had 80 or 100, depending on what division they were in. 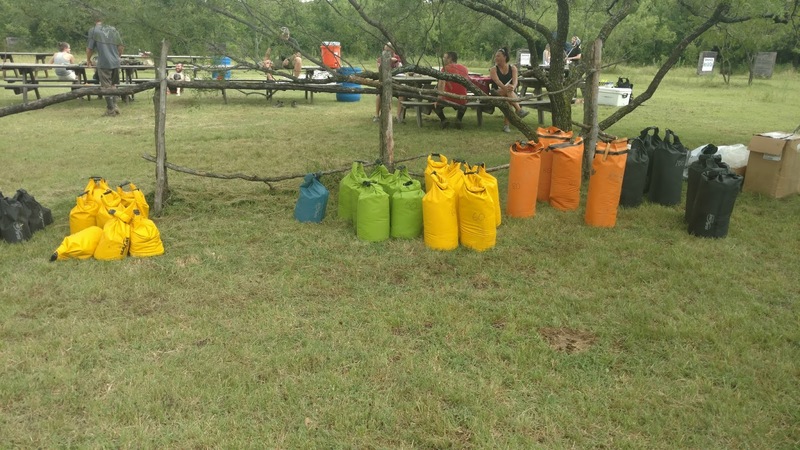 I had meant to bring my backpacking pack for this event and totally forgot it. Thankfully, another guy had brought an extra frame pack and loaned it to me. It was huge and didn't fit at all, but kept me from having to just carry a 60lb sandbag in my arms for 1.75 miles, so I was very thankful! 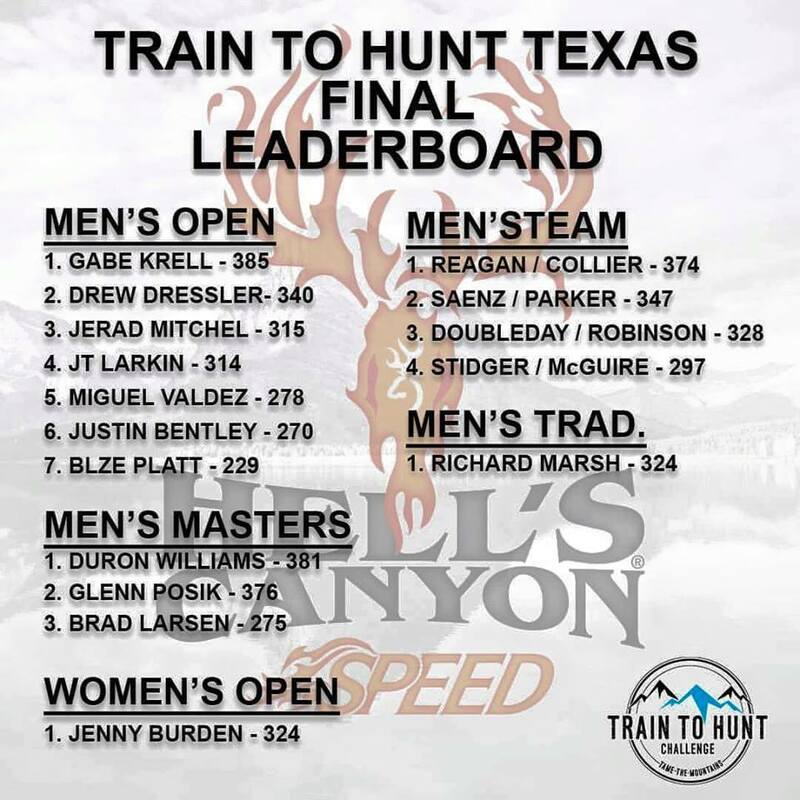 My heat was combined in with the men's master's and traditional, so we had 5 total. It POURED down rain right before we started, creating a ton of mud and a whole new level of challenge! I strapped on my pack and took off with everyone else through the starting arch and was quickly left behind. 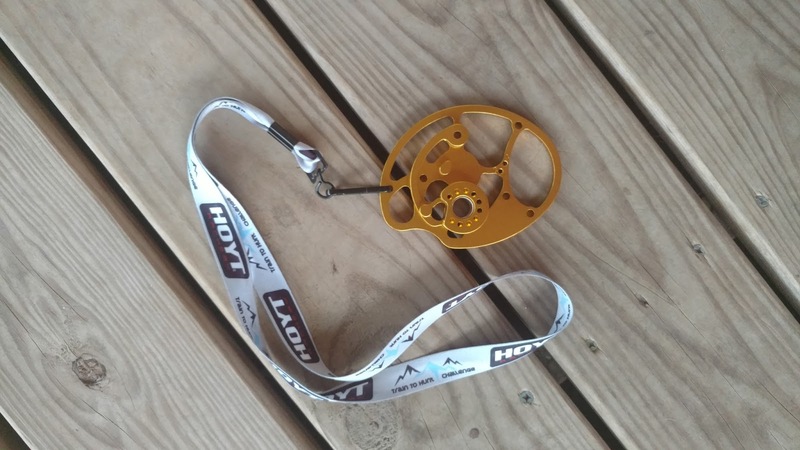 I was taking my time, remembering I have a much more expensive race coming in August, so I was power walking, hunched over like a turtle, for much of the course, shuffle-running when I could. I overtook two of the other runners about half a mile in and stayed ahead of them for the rest of the course, so I wasn't dead last, which was all I wanted! It was HARD carrying that much weight and moving with balance over the terrain, praying I didn't fall backwards and drown in the creek because I'd never be able to get back up. I finished in about 24 minutes, which when all was said and done, was a very respectable time. I'll be better prepped with a pack next year and try to beat that, too. That ended day 1, leaving all of us sweaty, super muddy, and tired, but ready to come back and see what we were made of the next day. Day 2 started around 8:30am with another meeting to go over course and break everyone in to heats. 6 heats of 3 racers/teams would cover about 1.5 miles with 20lbs in their packs (10 for me). 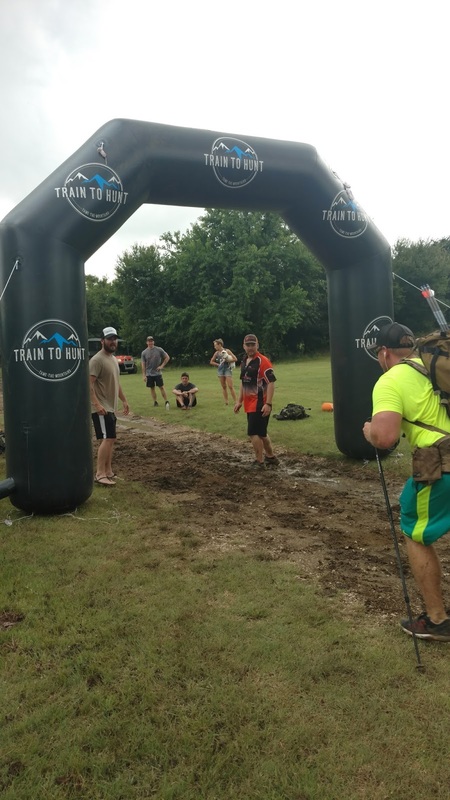 We started with the tire drag, then ran to a box jump, burpees, get-ups with our packs, and a sandbag shuttle run, shooting a target at each and running between them all until the finish line. I was in heat 3 with two of the guys I had shot with the day before. One guy, the traditional archery, was going to have a severe disadvantage because the penalty for missing was 15 extra burpees. My goal? DON'T miss because I am NOT a fan of burpees! I was last to finish the tire drag, but caught up at the first station, shooting and hitting the target before hopping up and over a box 15 times. This box was not very safe, and was my only actual complaint the whole weekend. It was a light wooden box that was tall, and could have easily toppled over if I took it too fast. 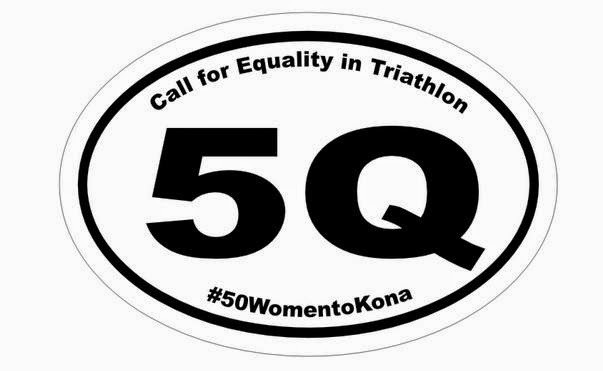 So I didn't- again, Ironman in 50 days! After that, I got through each station without missing, did my exercise, and by station 3 I was pretty solidly ahead. I finished first in my heat by about 4 minutes, immediately laying down in the shade to try not to die because it was so hot and I was drenched in sweat and quite possibly cow poop. Scoring for this was done based on time, with 30 seconds added for an outside-the-vitals hit, subtracted for a center hit (rings are on the targets), and so on. I have no idea what my actual score was since all I knew was that I never missed, but it would be cool to find out. I ended the event with a 340, which would have put me 3rd in the men's open. However, much of my scoring was based on how I placed in my division (Obviously, first!) so it'd be fun to see where I'd have landed had I competed directly with the men. DEFINITELY not 3rd, but I don't think last either! Again, I highly recommend checking it out if you're thinking about it! I'm a lot more sore than I thought I'd be, but it was well worth the challenge. I look forward to seeing how I improve next year. I saw your pictures from this it looked like a lot of fun! I would love to go next year! Congrats! Nicely written article. Good luck at your Ironman! Hi! really informative post about Hunting .thanks for information.can you give me any suggestion about hunting backpack? how to make a hunting bow at home.